Complexion: Dark complexion, some light scars. Physical Features: Her eyes always have a faint glow to them, sometimes becoming quite bright. Education: K-12, 5 years training in varied martial arts. Fluent in Draconic and a couple Elvish dialects. Slightly above human reflexes, CQC training specifically in sword styles, Small arms training, High level of spiritual awareness, and moderate planar shifting. Custom enchanted blades, several knives, poisons, gadgets, and custom 9mm. Last photo of Arianne before her kidnapping and subsequent change. Arianne was born as a typical human girl into a modest family in southern Louisiana to Garen and Casee Derouin. Her family included a couple older siblings, brother and sister by name of Quincy and Sharice. Early on in school it was quite clear she enjoyed fighting and was frequently labeled as tomboyish. This love of fighting found her in trouble quite frequently, though most occasions she got away with very little punishment as more than not her fighting was in another's defense. This however did lead to a reputation as a bully among some regardless of the fact she was quite the opposite in most cases. In her teens she had made a name for herself locally as one girl not to toy with. She seemed to spend a good amount of time in local gyms and training herself to the point that she was one of the top in her class and could mix it up with most of the boys, most of whom underestimated her despite her growing reputation simply due to her being a girl. One in particular, by name of Darrell Evans, was one of the few to treat her as an equal. They became fast friends always attempting to best one another and eventually as they got older grew even closer. It was obvious to everyone else by the end of school these two would end up married before too long. Unfortunately that was not to be as fate ripped the two apart during an ill-fated tournament they both attended. The end of the tournament would have been the moment Darrell had proposed but instead Arianne vanished just before her final match. It wasn't until weeks later that anyone found out what happened, or simply what appeared to have happened. Local authorities discovered the charred remains of a female matching her height and seemingly her dental records as there was no other way to identify the body. All who knew her mourned the loss and assumed her story were well and truly ended with the truth not surfacing until nearly a decade and a half later. Sadly her family would not see her again as they along with a few of her friends including Darrell were found murdered three years after this event. A crime that to this day remains unsolved. It is at this point we can only go by the discovered records and testimony of two survivors of a twisted experiment in the arcane. This event perpetrated under the leadership of one only later revealed as Terrathus Karnathus, whether this was his true name or not is still in question. The experiment itself was apparently designed to make what might have been a small army of functionally immortal slaves. The twisted designs took it one step further making these 'slaves' mixed with various animals wanting them to be less than human. Fortunately it largely failed with only two successes out of a full hundred, the failures sadly were all destroyed in the process in one way or another. The true reason we have any record at all is because they failed in part on the other survivor turned into, like Arianne, an arctic fox hybrid. Richard by name, was lost to them before they could secure him and ensure true control of his body. Richard would eventually return to put an end to all those involved, permanently. The other details shared, at obvious pain, by Arianne detailed how the worked. She described awakening chained to a sacrificial table of sorts already apparently changed at this point only to have a wicked looking dagger plunged into her heart, apparently later found to be the way they chose to seal in the unique form of immortality. Not long after she woke again finding she could no longer move, apparently after her 'death' they had sealed away her mind and stolen control of her body. She would not go into details after this only confirming that she was indeed the villain and murderer known only as The Undying, wanted across the globe for killing without any seeming remorse while she was forced to simply watch. This went on for ten years after her 'masters' put her body through rigorous training to turn her into a killing machine that while only three years would have been easily the equivalent of five or six due to no need for rest as simply killing her would force an apparent reset refreshing the body. She also revealed that her mind was frequently assaulted by her masters simply enjoying the torment of her sealed away mind. The end of her decade long nightmare came at the hands of the other survivor Richard. Unknown to her masters he had the same immortality and they made the mistake of sending her after him, the two of them killing one another a few times before Richard managed to subdue her and lock her into a medical coma working to finally eradicate the evil behind it all and finally free her. She was left in this coma a bit after being freed as the organization he belonged to worked to legally free her as well. When she finally woke she had been given a new life, resources seized from her former masters to pay for her home and give her a good bit of funding to start over with. She has since put a bit of work into recovering everything she lost with the stain left on her from the last ten years and all she was forced to do while her mind was sealed away. Among rebuilding she was however forced into therapy to deal with the issues that arose from those long years of torment she had to endure, slowly becoming more outgoing but still bound to snap at anyone over trivial things. 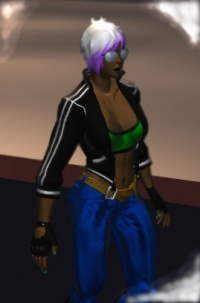 Currently enjoying a new relationship and employed as a stylist, even trying her hand at the hero game dealing with local thugs under the alias of Second Life, all signs show her well on the road to recovery and putting the abilities forced upon her to good work. With her life completely turned around she now works alone frequently in Millennium City's rougher areas bringing the fight to local thugs using the skills forced upon her to show the underworld a bit of terror frequently taking down criminals without them even aware they were being targeted. She's slowly gaining a reputation for quick surgical strikes most often from within the shadows not giving them much chance to react. Her knack to also seemingly survive any ambush no matter how much firepower they bring to bear has made her reputation even more frightening for the local criminals. She has also recently joined up with The Liberators organization to ply her trade in assisting in larger operations though she does not always adhere to every regulation. After serving with the Liberators for several months she vanished without a trace for nearly 6 months finally reappearing just recently with a gaping hole in her memory. As much as she hated the idea (even if she didn't admit it) she asked her boyfriend to look into her memories to prove to him she was not just making things up and to also learn anything she could about what had happened to her. Finding through him that she didn't just forget things and someone had quite literally torn the memory from her leaving no clue as to what happened during this time by apparently ensuring the gap occurred between when she slept almost seeming as if she had slept for months. This realization has lead her to question herself since she does not know what all could have been down to her and sh has since spoken with the Liberators head Tony and has been placed on reserve status until she can prove to herself and others she will not be a liability. Her memory loss apparently came coupled with a tear directly into the spiritual plane tied to her which also consequently started attracting spirits to her. It started slowly but she began to see them and even hear them eventually. It was through them she ran into trouble and also got a good bit of information about those who had been responsible for her memory loss. Several weeks in she used that knowledge and her training to vanish working from the shadows to pull down a major organization that itself was hidden using a cult as part of it's cover. She gave the local authorities several anonymous tips that lead to arrests though not always on time as some of the major players were found dead prior to the arrest. In the end her leads brought PRIMUS down hard on them in Arizona somewhere southwest of Phoenix in an underground facility assisted by a private security firm employing supers. In the end she was injured at that site, though not physically. The leader there pulled spirits through her from the spiritual, familiar spirits. Her deceased family. After that shock she left for Florida to ensure they were returned peacefully and to finally fix that tear within her. And shortly after hunt down the last man responsible for the gap in her memory. She spent a couple days talking with her family and preparing with a good bit of help to let them rest again in peace. After getting a proper farewell she became the focus of a ritual to seal the rift within her while also using it's origin to track down her last target vanishing into the spiritual realm for nearly a full day. Whatever happened within irrevocably changed her, she was human once more with a vibrant set of markings etched into her back and a soft glow radiating from her eyes. She has still not revealed what exactly happened within but it is clear it changed her. As noted above in her background she was somehow changed from the human she was into some sort of hybrid mixing with an arctic fox. Along with this change their was some form of binding trapping her mind within and leaving her powerless to resist the will of those responsible. In this state she could still think, see, and feel but she could not control the actions of her body. A body that was used by those in control to commit numerous atrocities ranging from minor political assassinations to murder of the innocent for whatever sick reason her controllers had. She was given the name The Undying due to the ability to come back from death no matter how she was slain. She had accumulated a hefty bounty before finally being apprehended and later freed of the bond and after a legal battle cleared of all charges due to not being in control of her actions. Even being a victim in this case some who knew of her still have difficulty trusting her. Using the knowledge she gained from observation while trapped and controlled she chose to don the figurative cape to find a way to put those skills to use and pay the debt she felt she owed for the damage caused through her. Seeing as much death as she had firsthand she did her best to ensure she never killed unless it was unavoidable. She chose the name Second Life due to her circumstances and feeling she had been given a second chance at life. She was not known nearly as widely as her former identity but was sometimes featured in the news. While she started posing as this heroine in secret she did eventually reveal her identity to the public in general with mixed results, it did however help her earn the trust of many who were doubtful though not all were convinced. Sometime between the beginning of her career as an independent hero and her reveal to the public she had met Tony Griffins and after working with him and his PRIMUS sponsored company The Liberators she was eventually approached to join them. She had accompanied them on several operations over the next few months making herself known among them until missing a routine mission and mysteriously vanishing shortly after. She returned several months after and placed on reserve status as she had the memories of her absence stripped and felt she could be a hazard to the team. Following a message to The Liberators from Arianne she briefly vanished while taking care of what she termed family business in Florida, roughly a day later she reemerged, changed. What happened to her is largely a mystery to all but those familiar with the Astral Plane. The truth is she became a wanderer within the astral and eventually befriending an elder dragon by the name of Uryte Lotho who took her in. Uryte was known within many communities of Faerie though not to all and the news she had taken a human in would seem unusual to the denizens of the planes making Arianne herself a curiosity especially after it was shown that she had been marked by the elder dragon. The Fox - Only listed for those that would remember her as a fox as she cannot normally return to this form. Before she was restored to her original human body Arianne appeared as a humanoid arctic fox. Her fur even bearing the seasonal changes common in the animal coming in thick and white during the winter and shedding in the warmer seasons to reveal a pale grey and sometimes brown coat. She would also frequently dye the fur along the back of her head with purple highlights. Beneath the clothing she wore she also bore a scar on her chest above her heart as if she had been stabbed through it. Other than those details she frequently masked her scent with a variety of perfumes and spoke in a very strong Cajun accent. 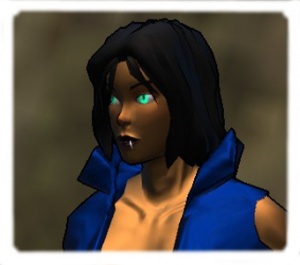 Now restored to her old body she appears to be in her mid twenties with with dark skin and short black hair that she sometimes will have held back in a tail. She clearly exercises a good deal and is quite physically fit likewise carrying herself as someone expecting or even desiring a fight. The first thing most would notice unusual about her is her eyes as the irises seem to glow with a radiant green light. The source of the glow is clearly magical as would be painfully clear upon seeing the runic markings upon her back. The markings seem to be more than simple tattoos as like her eyes they also seem to glow but more the seem to almost be a part of her skin. The markings themselves seem to be *Draconic in nature and radiate clear *Draconic magic to those sensitive or knowledgeable enough to recognize them. Due in part to the time within the astral her accent is all but absent most of the time. * - Unrelated to "The Dragon" but rather referencing dragons in general as defined by popular fantasy and manifested within Faerie. Arianne prepping for a couple rounds of "fun".. Despite the all she's been through Arianne is rather outgoing and friendly in most cases. She cannot be seen as very patient with certain behaviors however and can be rather combative at times especially with those who she feels are just acting out for attention or what she might think of as general stupidity. She tends to dress simply with loose fabrics most of the time as they tend to be easier to fight in. She will rarely be seen in skirts and heels and even rarer in full dresses. Her posture typically gives away the fact that she's almost always ready for a fight even while appearing relaxed. Fighting in all its forms including simply watching a good fight. Riding and working on her bike. Relaxing with a good drink. Meeting those of a planar nature. Running and a bit of parkour. Foxbat paraphernalia, unrepentant Foxbat fan girl. 'Heroes' that make no attempt at capturing criminals alive, and worse those that brag about their 'kill counts'. Telepaths, especially those that abuse the power. People insistent on sharing their life story with her after a first meeting. Don't know you well enough to care about your 3rd birthday. Pressing her for details of her life, especially when first meeting. Spiritual Sense - She has an apparent natural ability to see the unseen especially those of a spiritual nature. She also can intuitively understand all sorts of spirits without knowing their language allowing her to easily communicate with them almost telepathically. Planar Shifting - She can with little difficulty move between the planes though she does need some form of guide to find specific locations. Typically she uses this to blink between the material to the lower astral as she is most familiar with it giving the impression she can teleport. Spiritual Sensitivity - She can also sense a variety of auras though cannot positively identify all of them. 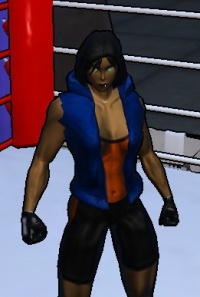 Experienced brawler - She has grown up with a taste for fighting and has many years of street fighting under her belt being a very skilled brawler and usually able to read most opponents from the years of experience making her dangerous even when disarmed. She is clearly a natural fighter with instincts honed to a keen edge and not one to underestimate. Blade style training - Her former masters used her ability to resurrect to train her body in several sword styles in such a way that would have been impossible otherwise. The training was more intense than any human would be able to endure, trained without rest other than to reset her physical form meaning she required no sleep or sustenance of any kind and trained her like this for a few years. While she was not in control of her body during the training she avidly took advantage of the training given her in hopes to one day turn it upon her masters. Since being reverted to human it has become apparent her skills have advanced considerably. Assassination - As her body was used for an extensive amount of assassinations she used the opportunity to learn from them and has picked up several techniques in the usage and creation of poisons and moving swiftly through the shadows to remain undetected. Even tough she has a preference towards sparing lives she is a very skilled assassin should the need arise. Her knowledge of poisons has only increased in recent events as she now has relatively easy access to extra-planar resources. Fantastically fluent - She has apparently also learned a good bit of the most commonly used Draconic and a couple dialects of Elvish. Human frailty - She is no longer effectively immortal subjecting her to the very real possibility of losing her life. She is only human after all. Paranormal Magnet - She does still have a tendency to draw paranormal entities to her, along with some extraplanars that may have felt she were trespassing. Glass Talons - She has a pair of heavily enchanted blades that appear to be constructed primarily of some form of crystal not native to the material plane. These crystalline blades seem to be very versatile due to the runes inscribed upon the blade itself each one granting them a different function. Crystal Shards - She has also replaced her old knives with magically imbued shards she can throw with deadly accuracy. They function similarly though like her Talons have more versatility through their enchantment and even return to her when called. Poisoned knives - She also possesses a pair of knives with a modular poison well that she can swap out to deliver a potent mix of varied poisons making a seemingly harmless cut from this pair very dangerous and if required quite lethal. 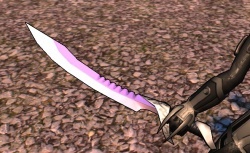 These knives are the only piece of equipment left from her former set of weapons though she rarely uses them. Dragon's Mantle - Her new preference towards combat wear comes in the form of a brightly colored garment similar to traditional martial artist attire. It differs wildly from her old gear and is heavily enchanted to protect her and even sharpen her senses. The cloth itself is even resistant to some small arms fire and temperature differences. The enchantments themselves improve upon this and also slowly repair damage to her and the cloth. When actively utilizing the enchantments she appears to be sheathed in a golden armor with some clear Draconic aspects. Enchanted Choker - The choker she wears is like her other gear enchanted and seems to lack any physical means of removing it. The front possessing a single pale green stone that typically glows with it's own internal light. The magic within seems to leave her resistant to enchantment and may have other possible uses that have not yet been revealed. Runic Tattoos - On her back she also now sports several etched marking of an arcane nature that seem to glow faintly at all times and may possibly be the source of her plane walking ability. Any damage to the area seems to have little effect on them as if they are a permanent addition to the very flesh rather than just surface markings, they also seem to be the source of the glow emanating from her irises leaving one to wonder how deep they run beneath the surface. The following items are rarely used, and only specifically when magic simply isn't an option. Chameleon overlay: Her recon gear has a woven nano-fiber that when in use will shift in color to match her environment to allow her to blend in nearly anywhere with relative ease. The system also effectively masks her body heat and has a number of countermeasures to fool most scanners with an additional light bending stealth function to become nearly invisible for brief periods. IFF HUD system: She also has an unobtrusive HUD to feed her valuable data when in the field. It is coupled with several scanners and a communications uplink to allow her to more easily identify threats and keep in constant contact with her team when not working alone. Utility belt: She has a custom utility belt of sorts containing the power core needed for her other systems as well as holding several doses of her various poisons and various devices for intrusion and some basics like climbing claws, durable bindings and a pair of power nullification cuffs. Stonehold: One of the more common poisons she uses it is a blend that spikes the target's adrenaline and uses the increased blood flow to spread the toxin quickly most targets effectively paralyzed. Blinder: An infrequently used blend, this toxin attacks the targets senses enhancing their sight and sound to the breaking point making each sound and bright light excruciatingly painful frequently resulting in the target passing out from the sensory overload. Deadman: A specific blend designed to completely deaden the nerves and render the target largely immune to pain, one she has used on herself before and is also useful in helping those who are in pain to help them relax. It can be quite dangerous to employ however as the target will not realize how much damage they have taken and could be fatal in some of these cases. The Truth: An advanced psychoactive drug, commonly referred to as a "truth serum". Pain Factory: A rarely used blend that attacks the pain receptors overwhelming most victims. Painful but not usually deadly except in unhealthy individuals, it also stabilizes them typically preventing death. Soul Binder: A new addition made from ingredients not native to the material plane that will typically fatigue any mortal being including those normally immune to poisons. On the undead and summoned beasts of a magical nature it proves much more dangerous able to outright kill them by returning the soul to it's home plane effectively un-animating the undead. Cracker: A small device used in bypassing electronic security with an always updating collection of programs. Knocker: A small explosive device that works quicker than her preferred devices blasting apart most locking mechanisms to open a door. Picker: A small device that gradually through the use of nanobot technology fabricates a temporary key when placed upon a lock. Smoker: A compact version of the typical smoke grenade that surprisingly can create a denser cloud of smoke than the normal military version. 2002 Harley Sportster 883 Custom. Still in excellent condition with a purple gloss finish. Her preferred means of civilian transportation. Belonged to her father. 2012 Honda Civic. Used infrequently and typically only when she needs to pick up things she can't on her bike. Meta Zarvos - a genetically engineered cat manimal, and a bit crazy to boot. She dated him for a few months and had moved in at one point. Mischievous - Long lived phoenix and inquisitive friend. Ballanxe - A human chemist specializing in a variety of toxins and other concoctions and a hero in here own right. Easily identifiable by the green hair and single green eye, results from an experimental chemical. She has not been seen recently however. Harry / AKA Dead Serious - A fun loving hero and bar tender at Club Caprice. Easily identifiable by the purple mohawk he sports with a disco life style outfit or skull mask and purple armor. Always easy to get along with and funny most of the time. Ryuko Executive Solutions - Private security firm employing meta-level operatives. Largely responsible for Arianne's freedom. Richard Respawn - Her eventual rescuer and an arctic fox hybrid with the same unique power as they were both made from the same group of dark magics. This page was last modified on 22 September 2017, at 00:19. This page has been accessed 108,687 times.